Are you someone who loves rustic home decor? Well, that makes two of us! I love shopping for anything and everything rustic. But then, I realized–why was I spending too much money buying rustic home decor when it’s just so much easier to make them? Do you have a blank wall at home? It would be perfect for this DIY open shelving project! For this one, you will need pine wood shelves and brackets. To achieve the rustic feel, pick a dark wood stain. Not only does it look great, it’s a great way to make use of your vertical space for storage! Who would’ve thought that an old ironing board can turn into a beautiful rustic welcome sign? Thanks to the genius DIY lovers out there, we can now take on this project too! Does it look difficult to make? Don’t worry, there’s no professional woodwork skill required for this one. Sometimes, a little paint work is all you need to revamp an old piece of furniture. Take this vintage dresser for example. This dresser has been handed down three times. But after repainting, the new color helped highlight the gorgeous rustic wood underneath. Is that bare corner in your room bothering you? Maybe it’s actually begging for some redecorating. Instead of hanging your photo frames on walls, hang them on this tree branch photo ladder that will look great in any corner. Adding some rustic charm to your kitchen or coffee table is this DIY Rustic Wood Tray. For this project, you will need at least eight pallet boards, screws and white paint. After some work with your screwdriver, you’ll have your little kitchen organizer. Are you looking for home decor that feels close to your heart? This customized initial made from twig is a project you must do. It’s cute and unsophisticated, which is actually the look we’re going for here. I’m a huge fan of photo frames and I probably have one too many of them in our home. I like seeing our family’s best memories on our walls. But then again, I also look for other ways to display our photos without using the same old frames we can get anywhere. Thus, this DIY Photo Clipboard is definitely on top of my list of must-dos for this week. If you’re someone who’s searching for a side table that won’t take up much space, you got a winner right here. This DIY Stepladder Side Table is a genius idea! It might take a little more effort to make but look at the final result, it’s a rustic home decor that you can’t get anywhere else! I don’t know about you but I had the hardest time looking for a mail sorter. That’s until I found this tutorial and just made my own. The search is over and this beautiful rustic mail sorter hangs right beside our door. I still love it today! I’m a self-confessed Mason jar hoarder and sorry, but I’m not ashamed. Even though my husband teases me that I have too many of them, well, what can I do? I love them! One of the reasons why I like collecting Mason jars is for brilliant projects like this one. These jars are practical and ultra-versatile! The first time I saw these chevron arrows, I knew I had to make them. Unfortunately, I don’t have reclaimed wood on hand yet so I’m putting this project off for later. Nonetheless, that won’t stop me from sharing this cool DIY tutorial with you. Trust me, your bare walls will thank you for it! You know what, I always see these cute small baskets in home decor stores but I never got around to purchasing them. Lucky for me, I didn’t have to. This DIY Paint Stick Basket tutorial is so easy and affordable to make that I’ve already made three of them. Two of the baskets I used as storage containers and the other one I used a decorative piece for our bookshelf. I’ve always wondered how to achieve the rustic paint look. Thanks to this tutorial, I finally learned how. And more than that, I’ve got more rustic flower pots now too! Rustic home decor can easily add an unsophisticated and country-style look to your home in an instant. And the best part of it all is that you don’t have to spend on these too! Upcycle an old bookcase into an elegant accent piece with copious storage space. Rustic, charming, and oh-so-functional, you can create a custom look on a crafty budget. You can whip this project out in a weekend! Here are some things you will need for your next upcycling project. -Bookcase. I found this cheapo old bookcase on Craigslist for $25, what a deal! There are a few key things to look for in your bookcase. – Make sure that the sides are completely flat all the way up – you don’t want molding that sticks out around the edges. – Ideally, the bottom and top of the bookcase will be identical. If you can’t find one like that, at least make sure that when you set the bookcase on its side, the bottom (which has now become the side) doesn’t look terrible. Sometimes there are all kinds of screws, braces, and ugly elements in that area, since it’s generally just facing the floor. -Lumber: One plank of 1”x”12”x6ft – this is what you will make the cubby shelves out of. -Wood Trim/Moulding. I went for an elegant rope moulding. -6 Wooden Feet. If you are doing a short little bookcase, than 4 feet will work fine. If you’re doing a full size bookcase, 6 feet with provide better stability. -Spray Paint. For the bookcase, you’ll need an undercoat (I used one can of a taupe color), and an overcoat (I used 3 cans of ivory). -12x12x12 Cardboard Boxes (10 of them). Uline.com is always a great source for boxes or many sizes. -Textured wallpaper. I found mine on Amazon.com at this link, and needed only one roll to cover all of my cubby bins. -Hammered Copper (or just plain metallic copper) spray paint. Using your 1”x12”x6ft lumber, measure the exact space between each of the bookcase shelves, and mark up your board with a pen or pencil. We are going to be cutting small shelves and inserting one between each of the existing bookshelves of the bookcase. Use a power saw to slice through your board until you have a nice stack of shelves (I needed 5). Sand the edges of the shelves when you are through cutting them. Turn your bookcase onto its side for this next part. Now take your heavy 2” width board and lay it flat across the length of the bookcase (which is now on its side). This thick board will eventually serve as our table top. I wanted mine to hang out over the edges a bit, so I positioned it how I wanted it, marked it so that I’d have an overlap, and used a saw to slice away the extra on the end. Use sandpaper (or an electric sander) to smooth out the edges of the board you just cut. Take your trim moulding (in this case, my little rope moulding), and lay it along the length of your big board to get a sense for how long you want it. I wanted my rope moulding to end about 1” from each end. Cut the moulding to your desired length, and round down the ends with sandpaper. Apply wood glue to both the surface of the moulding and the side of your thick wood plank. Attach them together, pressing firmly into place. I had a tricky time getting my moulding to stay while it was drying (it was at such an awkward place to try to get clamps on it), so I decided to sink a few nails along the length of the rope. That worked splendidly! I then used a moist paper towel to clean up the excess glue while it was still wet. Once all of your glue dries, apply your wood stain with a sponge, brush, or even a paper towel. If you get the wood stain on your hands, it’s a beast to scrub off, so I would recommend using rubber gloves. Now back over to the bookcase, which is still lying horizontal. Use wood glue to attach your wooden embellishments to each end of the bookcase. Once everything is coated in paint, these accents really add a subtle aura of craftsmanship to your piece. The next step is to add our shelves! To get them to stay up, we need to use our little metal shelf pegs. Using a drill with the appropriate size drill bit, bore holes for 4 pegs under each shelf (two on each side, just like your average bookcase shelving system). Once you have the holes drilled, pop your little metal shelf pegs into place. Once you have all of your pegs in place, slide those shelves into place! Things are starting to take shape now, aren’t they? In this photo, also notice that I used some of my extra rope moulding on the right side of the bookcase – it helps dress up that extra-wide area on the far right. Tip your bookcase back into the upright position – time to add the legs! Don’t worry if some or all of your new little shelves flop over, because we’ll be removing those for painting in a moment anyway. You may as well take them out before you tip up the bookcase. Once the bookcase is upright, mark the spots where you want your legs to attach and drill holes at those points (only drill holes if your wooden furniture legs have threaded metal pegs at their centers). Apply a small amount of wood glue (less than I have pictured there!) onto the top of the foot pieces. I applied too much, and it simply gushed out everywhere. About half of what is pictured will do just fine. Screw the legs into place, clean off the excess glue, and let it all dry. While it’s drying, go ahead and do your first coat of undercoat paint. I only used one can of the taupe spray paint base coat, and I only hit the areas that I wanted to have it show through later (I skipped the inside of the cubbies, since they will be covered by the storage boxes, and just did everything else). Once the base coat is dry, flip your entire piece into the horizontal position again (test out those new legs, yeah!) and spray the top coat. Once you are happy with the amount of top coat (in my case, the ivory color) that you have applied, attach the “table top” stained wood plank with copious amounts of wood glue. While wood stains, glues, and all of that is drying outside, let’s work on the cubby bins. Assemble your 12”x12”x12” shipping boxes. Use the Gorilla Tape to fortify the edges and joints. The great thing about the Gorilla Taper (verses Duct Tape), is that it has a kind of mesh inside of the adhesive, making it incredibly strong, and inflexible so that it doesn’t warp over time. Once the box is fortified with the tape, it’s time to cover it! Now, you can cover the entire box, if you want, but I opted to cover the front and just a bit of the sides, bottom, and inside. It not only saved time, but also ensured that I would have enough on just one roll to complete the project. As you can see in the picture, I cut a panel that was approximately 20”x20”x20”. Here’s a look at the inside of the box, as I wrap it like a Christmas present. Use the Gorilla Tape to hold down all of the edges – it provides a nice, strong hold. Once your boxes are covered with the wallpaper, lay them out on a protected surface and spray paint them with the black paint. Give it a nice, mottled look. Once the black paint has dried, spray over it with the copper spray paint, once again, going for a mottled look. Doing the black undercoat first really adds a richness and depth to the copper. Once your boxes are dry, just slide them into their cubby shelves in the bookcase, and you’re done! Can you believe this elegant storage space came from an old bookcase? Now this is the art of upcycling! We’ve been doing some makeover around the house and I felt that I wanted to go with a rustic feel in the bedroom. I don’t want just a splash of new paint, I wanted something different. So my solution, build a pallet wall! It will create an instant rustic feel and it’s also easy to make. Once you’ve deconstructed your pallet the rest will be a breeze. So let’s get started! Deconstruct your pallet. If you plan on doing it one nail at a time, there’s an easier way. See how you can easily deconstruct a pallet here! Prepare your wall by cleaning it or coating it with a fresh coat of paint first.After you’ve prepared the wall measure it with how much pallet you need to use. OOPS! The original video was taken off Youtube – but you can view a similar one here by Valhalla Woodworks. Organization, function, and style. These are the essential three things you need to keep your household in top shape. All these three key points can be found in these DIY 3-step crate shelves. Both functional and redefining, this DIY project is a great addition to any house interior, so we’ll show you how it’s done. We wouldn’t want our crate shelves to be rough and rugged, now do we? As with many wood projects, we first start with refining the wood, sanding the rough edges and parts of the wooden objects. In this case, we sand the wooden crate. This will help clean the surface from wood splints and ready it for the staining. Wood by itself already has quite the appealing color. However, that color may not fit the color scheme of your house. Staining the wood will provide you a wider variety of colors, its grain patterns being more pronounced. If you plan to enrich or deepen the color of your wooden crate shelves, now’s the time to stain the wood with a darker color. Before the stain dries, you may opt to wipe it off already with a rag. This is done to achieve a more vintage vibe and natural feel to the stained wooden crates. 3. Install the crates after drying. Afterwards, install the crates on the wall using your drill and screws. Take care to place the crates in measurement, as making a mistake now, such as uneven crates, might cause you a headache later on. 4. Arrange your things on the shelves. Of course, after installing, you are free to place your desired objects and arrange them on crates to be stored, be it books, papers, shoes, or decor items. Little planters can be put in these crates as well, or you can follow this tutorial on the video below to learn how to display your jewelry or accessories here too. This kind of shelf will be perfect for your walk-in closet, or simply place it in the middle of your living room or bathroom. Not only stylish, these crate shelves are extremely practical, allowing you to place things in great display. Looking for a woodcraft that will make a great bedroom decor? Make a DIY headboard that will make you want to stay in bed all the time. This reclaimed wood headboard will be the focal point of your room. If you’re looking for some headboard ideas, here’s one you should try out! This easy to build wood headboard is inexpensive and you can finish this in one afternoon! So turn weathered woods into a beautiful headboard with this easy reclaimed wood headboard tutorial and save money! Ready? Let’s begin! Stain the plywood backing. For the backing, we used a piece of plywood that’s 4 ft x 4 ft x 3 1/4″ thick. You can use a roller to stain your backing. Once it’s all over the plywood, you can use a rag to wipe the excess all over it. Did you enjoy our reclaimed wood headboard? Let us know in the comments section below what your thoughts are on how to DIY headboard. Do you have any other woodcraft you’d like to share? Share it with us and we’ll give it a try. We love doing cool DIY projects by making craft projects, home decor projects, upcycling ideas, recipes, tutorials and anything you can do yourself. That’s why we created this site, we want people to be more in touch with their creative side and realize that there’s a lot of things that they can do themselves. Once upon a time…while on a walk around my neighborhood, I came across some discarded apartment building window panes on the side of the road. These windows make the perfect base for a reclaimed wood coffee table if I’ve ever seen one! To add some more magic to this DIY furniture project, I gathered some discarded wood branches to add some extra detail. Combined with moss, fake flowers and a little love, and you have yourself a unique furniture piece made mostly from upcycled (and FREE!) parts! Elevate your project to make an easier working space. Put on your dust mask!!! Next, start sanding down the old paint. When sanding, I found it easiest to move your electric sander in small, clockwise circles. Sand until you can feel a slightly rough texture to your wood. Repeat on all sides of both windows. After this step, you can discard your dust mask. Pop on that dust mask and take your project into a well ventilated area. Use sander to prep wood. Because I am using vintage windows, I need to reinforce the molding that holds the window glass in place. Bust out your caulking gun and hold it at a 45 degrees angle to your window. Slowly spread the caulking along the edge of the glass until all the panes have been reenforced. If needed, go over work with a straight edge to smooth the caulk, though often the best tool for leveling caulking is the good ol’ human finger. This will take about 30 minutes of dry time for each side, so long as you buy quick-drying caulking. Reinforce your base with caulk. Tape all seams of the glass with painter’s tape. Take your brush and apply a solid black coat to all sides of your window. If you get some paint on your window, don’t fret! Allow paint to dry, then take a straight razor to remove. Tape off edges to make clean paint edges. Apply black base coat to wood frame. After the wet paint has dried, take a dry brush and dab your brush into the white paint – a little paint goes a long way with this technique! Start streaking the paint onto the wood. The goal is to show the previous layers of paint to give the illusion of a worn, aged feel. I just love this shabby-chic furniture look. Apply as many coats of white streaks as desired. Apply to all sides of both windows. After you finish this step, you can remove the painter’s tape. Streak white paint over dried black paint. Before we go any further, it’s time for you to decide which window will be the top of your table and which will be the bottom. As you saw in our finished image at the top of this tutorial, we are separating our two panes with four, pre-made table legs. These legs come in a variety of styles at your hardware store, but they all come with a threaded attachment on the top for screwing into a table. After deciding which pane will serve as the TOP of our coffee table, we need to affix our table legs. You will be affixing the legs to the underside of the top pane, so flip your pane over. Line your ruler or tape measure to the window’s edge and mark with your pen at the 2-inch down from the corner. Then measure about an inch in from this mark. This is where you will be drilling. You’ll want to do this with all four corners of this pane. Measure and mark placement for your table legs. Take your 5/32 inch drill bit from your drill kit and attach it to the drill. Place your drill over the pen mark and drill halfway through the wood. You do NOT need to go all the way through, just far enough that the threaded head on your legs will have room to sit completely inside the holes. Use both hands to brace the drill to keep it steady and in place. Do this to all four corners. Drill over marks to make way for table legs. Take your table legs and apply wood glue around the end with the exposed threaded attachment. These ends will be inserted into the holes created on your top pane. Here we are looking at the underbelly of your top pane. This is where the legs will go. Dab on some wood glue before screwing them in. Your pre-drilled holes are going to be a little smaller than the threads of your legs, which is good, because you can screw them in and tighten them down nice and firmly into the window. Use wood glue to secure table legs. Now that the top pane is firmly in place with legs, break out your tape and mark the other pane (which will be our base) in the same corners as you did the top (2-inches down and one inch in from corners). At this point it does not matter which face of the base pane you mark. Take the same bit you used before and drill ALL the way through your marks on the bottom pane. We will be affixing the other side of the table legs with screws because these ends of the legs are not threaded (as the ends of the table legs traditionally sit on the ground and not in-between two windows!). Take the top pane with the legs currently attached and flip it over. Place the bottom pane on top of the legs as shown below. Here we are looking at our table upside down. Line up your legs so they are centered under the holes you already put through the bottom pane, then pre-drill through the window and into each leg so that your screw will eventually go right down into the center of the legs. Then finish off by screwing each leg down, one screw into each. With the table still flipped over, it’s time to add the real feet to the bottom of your table. If you have purchased your 2 x 4 wood at a home improvement store, you can have them cut it into four-2-inch sections if you aren’t comfortable using a saw. You can also use the handsaw at said stores if you don’t own one. Place the wood blocks at each of the 4 corners. On our windows, there was a little molding in the way near the edges, so we just put them as close to the edges as we could. Use the 5/32 -inch drill bit again and drill holes into the feet through to the window wood. Use the screw attachment and some more of your exterior screws to secure each foot to the table. Drill through block and coffee table frame. Secure with screws. Then paint your legs and feet as desired. We decided to make everything black! Paint table legs and feet to match top and bottom frame of the coffee table. I collected about 20 pieces of discarded branches. Each branch should be the same height as your table leg. Measure each branch with your ruler and mark off where you need to cut. Use a bypass pruner or shears to trim branches to the correct length. Gather branches around your neighborhood or ask your landscaper to save you some clippings. Cut to fit with your bypass pruner. Use the black pen to mark where you would like to have your mini trees take root on the bottom frame of your table. Drill completely though the frame to make way for to make holes for the screws with the 5/32 inch drill bit. Drill holes for screws through bottom of your frame. Next, drill into the branches that will be connected to the window base. You don’t have to drill far, just enough for a bit of the screw to grab hold. An half-inch should be plenty, just eyeball it based on the size of the branches you use. If you chose super tiny branches, try wood glue instead. Make holes in base of branches to help screws stay in. Use the screw bit and screw through the frame and into each branch. If the screws happen to peak through, don’t worry, we will be covering them with moss. Flip your table right side up and admire your work – you are almost done! Screw in branches from the bottom side of the table to secure branches. Screw from the bottom side up, then attach branches. Progress so far after this step. Time to make this table enchanting! Hot glue moss on the base of the coffee table, sides, on the branches – anywhere you like! Add flowers to give color and a soft romantic feel. I found these faux flowers attached to wire, which worked great for twisting over the branches. You can also roll the Spanish moss in your hands to create thicker moss vine-like pieces too! Create a mini forest by adding flowers, moss and rocks to your branches and table. Decorate the table legs too! Now you have a coffee table that is right out of a story book! Enjoy your reclaimed wood coffee table that is sure to be a conversation starter at ay home gathering or event. Completed coffee table, full of rustic charm! Want to know what wood would work for your DIY needs or even for your home project? Read on because we found some tips that can help guide you in the right direction! Picking what wood would work is no simple task. In case you’re having some trouble finding the best wood for your DIY needs or even for your home projects, stop stressing and put your mind at ease by picking the right wood. The classic preference to use wood when crafting a home has stood the test of time. Luckily wood has many attractive qualities including it’s fairly low cost, it looks incredible, it’s solid, it’s warm and comfortable and it can last forever. It can be utilized for almost everything from building furniture to warming the home to making fire for your fire pit. When doing DIY projects, it’s always best to know what types of wood are most applicable for the project at hand. Every variety has its own particular properties which will make a huge impact on the look and feel of your finished project. Some woods age beautifully, while others still need some paint or polish. Some are easily scratched and dented while others resist shrinking and swelling. With the large number of wood varieties to choose from, knowing which wood would work best for various projects is essential to creating a cohesive and finalized product. The wood’s scent, color, and texture are components that draw you towards different styles. Similarly, these components, while adding to the feel of a home, are the challenging aspects when choosing your wood. Kudos to the guys of Heiton Buckley who’ve come up with the amazing info-graphic below that will help you when picking the right wood for your project. There is some great wood wisdom here, so have fun and enjoy! When it comes to improving our homes, many of us within the modern world are without the skill sets that would have been common even a generation ago, such as working with two by fours or sewing our own clothes. Work — even the kind that used to be done my most people on a Saturday afternoon — has become so highly specialized that even tinkering has become a lost art. For the resolute DIYer, however, the reality that the times have changed is little more than a challenge to recover what has been lost. If you have projects around your house that you’d like to take on, rest assured that there is plenty you can tackle yourself, regardless of your experience thus far. Save yourself some money, rack up some rewards points on your credit card and bask in the wonderful feeling of self reliance. Whether your hardwood has seen better days, or you’re living with linoleum that makes you feel like you’re caught inside a terrible time warp, the desire to change what’s underfoot is an almost universal one among homeowners. And, when you haven’t the time, money, or know-how to really rehab or transform your floors, you can begin to believe you’re stuck with them. While it may seem unorthodox at the outset, one quick and attractive fix is to paint floors that look bad. All you need to do is clean them well, lightly sand them, and tape off the walls or baseboards. Be sure to use a paint that’s made to endure being walked on, and use a high-quality roller or brush. Bright white or a bold, solid color both work well, but you can also tape off designs and take a two- or three-tone approach. Whatever you choose, be daring. If you don’t like the way it turns out, you can always just paint it again. There are a number of ways you can improve your front door depending on the amount of money you have to spend, and the amount of time you have to commit to the project. If you’re short on either or both, simply choose a vibrant color and a high-quality paint and, after preparing the surface properly, get to work painting your front door. You’ll instantly feel like you’ve upgraded your home every time you step through it. If you have a little more time and money to devote after painting it, look into upgrading your door’s hardware. From vintage locks and handles to brushed nickel or stainless steel, changing out hardware take a bit more time and effort, but it can add a classy look where before there was just pragmatism. From the kitchen to the bathrooms, faucets are an essential part of cleaning, cooking, and being clean, and over time, they can wear out or simply begin to look dated. Without reinventing the wheel, find replacement faucets that will fit the sinks and holes occupied by the ones you have now. Grab your tools, a free afternoon, and watch a YouTube video or two. With a little time and focus, you’ll have the new hardware up and running in no time. While true electrical work is best left to a professional, you can easily update light fixtures with little more than the wherewithal to turn off a breaker. Transform your dining room’s pendant light into a mini chandelier. Change out ceiling fixtures in bedrooms and bathrooms with vintage pieces, flea market finds, or department store clearance gems. Then, pull all your breakers back into the “On” position, and run from room to room switching on every gloriously new light in your house. One of the easiest ways to upgrade the looks of your home is to focus for a moment — or a weekend — on improving its curb appeal. Step into the street and face your house. How’s the lawn? The landscaping? Are there toys, tools, broken steps, hanging shutters, or anything else in your view that seems out of place? Whatever you see that takes away from the inherent good looks of your home, get to work setting it aright. While some aspects of curb appeal require little more than cleaning up, others take time and effort. Repair hanging or missing shutters or trim. Paint your mailbox if it’s looking drab. Clear out flower beds of dead and dying detritus, and break out the edger for the tufts of grass at the edges of your sidewalk. In every way you can, make your home’s exterior a domain of calm tidiness. Then, commit to maintaining it. Upgrading your home is one of the most rewarding ways a homeowner can spend her time, and it doesn’t have to require the skills of a master carpenter in order for the improvements to be noticeable. We expect you’ve worked hard to get your game room, and you certainly don’t want to mess it up with lots of holes in your wall. You may be a darts pro but your guests (and maybe children) might not be. To avoid this messy situation, you can build yourself a wine cork dart board backer. This is especially good if you’ve been saving wine corks for a DIY project (if you haven’t you’ll have to open a bottle and get drinking—responsibly). The various shades make the piece rather artistic, and you can always opt to color your corks, if you feel like funking the backer up. Detailed (and easy) instructions here. Recognize this? You’ve also seen it here! This is easier than you might think, just follow these very simple instructions. 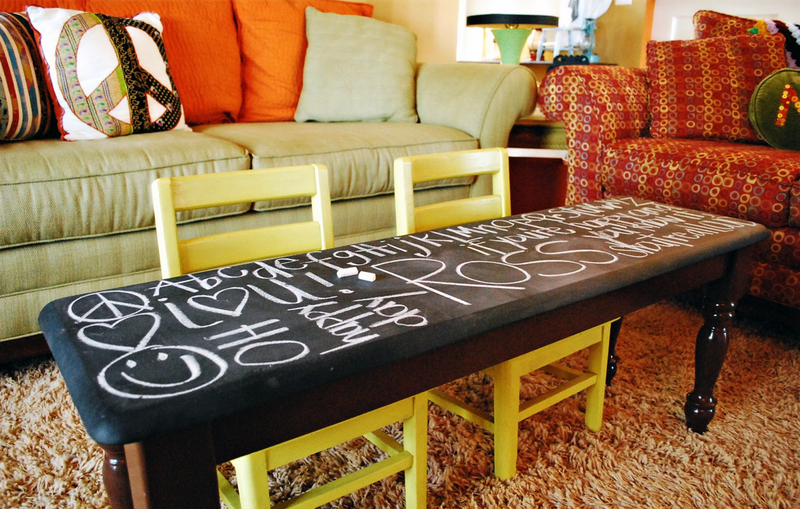 And if you want to make DIY chalkboard paint, check this out too! This doesn’t have to be a huge project either! These guys have made a brilliant entertainment center for under $50 using cinder blocks and wood. Do watch the video tutorial. And if you don’t have a wifi yet on your game room, there are games that requires no wi-fi. Love pallets? Don’t miss these projects! 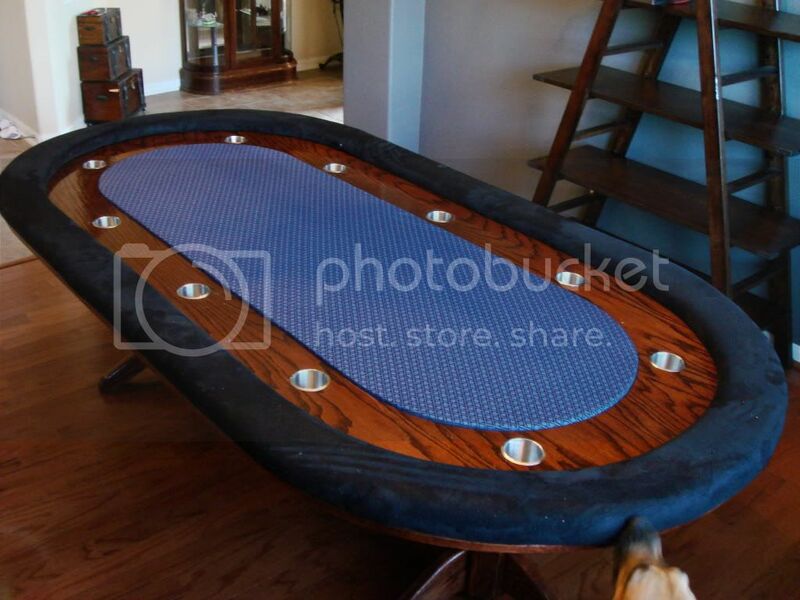 If you’re planning on inviting guest to play on your brand new poker table, you should take into consideration that they might not be as up to speed with the game as you are. Or perhaps you’re not that experienced yourself, no shame in that. 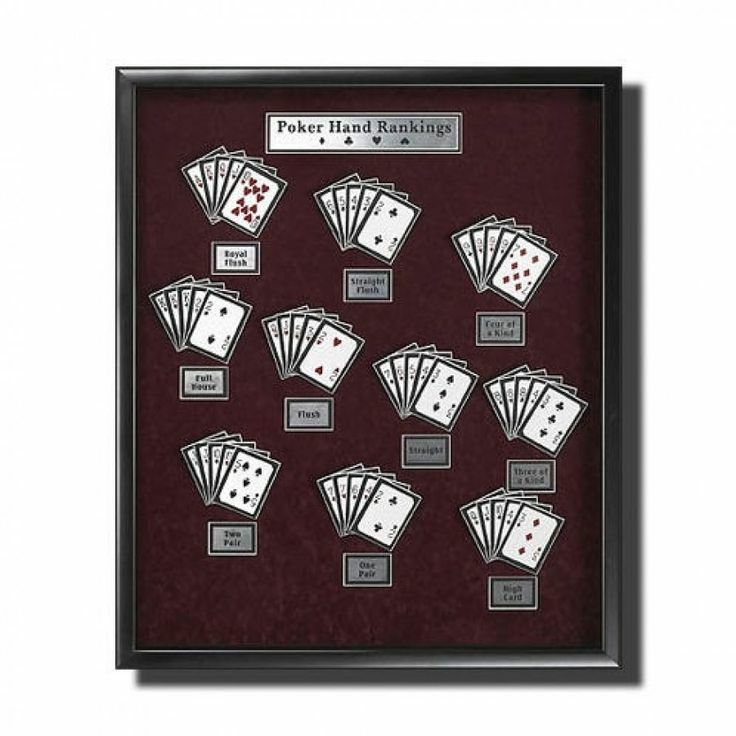 To solve this minor issue and add some relevant artwork to your game room, consider printing out a useful wall guide of poker hands. This could be easily achieved by buying a ready-made frame that will suit the decor of your game room. Cut some thin but sturdy, card to fit the frame. Using real packs of cards, lay out and stick down the hands in order—cardboard glue should suffice. Lastly, label your hands so that people know what they’re holding (or pretending to). If you’re not totally confident about what each hand is, you can take a look at a poker hands guide, to make sure you’re getting it right. Every good game room needs plenty of storage of your board games, cards, rackets and whatever else you need for fun to commence, but that doesn’t mean that your storage has to be boring, plain drawers! Some clever chap has only gone and made a set of Rubik’s cube storage draws—that actually spin. This might be a bit of a brain scratcher to make, just like the game, but these instructions will prove very helpful. So there you have them: our top seven DIY game room ideas. There are loads more great DIY game room projects out there, and we hope you have as much fun putting your new room together as you will using it. Happy DIYing! So which one will you make to add to your game room?